Momentum might be one of the most over-cited concepts in sports. It's an idea borrowed from physics, and is something we witness every day. We see it in rising tides, building storms, and boulders rolling downhill. But does such a concept apply to sports? Certainly, better teams will likely continue to prevail, and lesser teams will likely continue to lose. But that's not momentum. It's just better teams being better. In this article, I'll explain why I think we see momentum when it's not really there. And to test the existence of momentum within NFL games, I'll compare the results of drives following 'momentum-swinging' events with those following non-momentum-swinging events. I think the idea of momentum in a game is almost fully attributable to an illusion. It is well known that people are not good at interpreting randomness. True independent random events tend to be less alternating and more streaky than we expect. I've previously written about the story of a professor who challenges half his class to invent a random sequence of heads and tails and write it on the chalkboard. He tells the other half to actually flip a penny and record the results on another chalkboard. The professor excuses himself during the process. After the class is done, he re-enters the classroom and can instantly tell the true random sequence from the fake sequence. The real one has many more long runs of the same result than the fake one, because the students underestimate how streaky real randomness can be. It's no different for fans, coaches, players, and commentators. Naturally random performance on the field often appears as streaks, and we're interpreting this as momentum because it violates our expectations of alternation. And if we allow ourselves to cherry pick the endpoints of our definition of when a run of momentum begins and ends, the illusion of momentum is enhanced. ...I think fans and analysts alike are susceptible to the idea of momentum because our brains are geared to detect patterns from nature. Football teams and their win-loss records are very, very abstract constructions, but our brains aren’t built for such abstractions. Voodoo analysis is the application of apparently intuitive patterns beyond their natural settings. 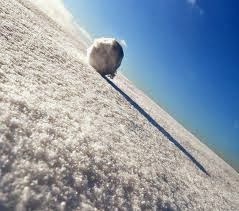 A football team is not a boulder rolling down a hill. It’s not a river bursting through a damn. It’s not a spreading fire. Our brains are continuously looking for patterns like these, and often see them even when they’re not there. One way to test momentum is to examine drive outcomes based on previous outcomes. If momentum exists in football, we should be able to detect increased performance following a prior momentum-changing event. After a significant event such as an interception, fumble recovery or blocked kick, we would expect to see an inspired team that succeeds more often than we would expect if such a momentous event had not occurred. Looking at drives from the 1999 season through week 8 of the 2013 season, we can get an idea of whether momentous events tend to spur increased performance. For this analysis, I examined scoring rates on drives according to how possession was obtained. Drives are classified as "Momentous" and "Non-Momentous." Momentous obtainment included turnovers, blocked punts, blocked kicks, muffed punts, muffed kicks, and of special note--turnover on downs. Non-momentous obtainment included standard punts and kickoffs. I was unsure how to classify missed FGs. They can be thought of as momentum-swinging in close games, but they occur on 20% of all attempts, too common to consider momentous. There is more to momentum that just how possession is obtained, but there are few events that cause bigger impacts on Win Probability than turnovers, blocks, and stops on downs. Although we may not be capturing all momentum-swinging events, we are capturing the vast majority of them. 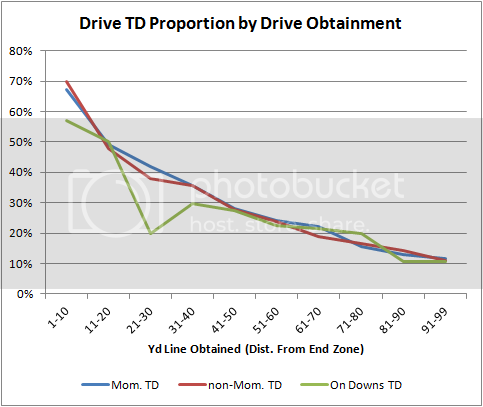 Not every drive would be expected to benefit from a momentum effect following a big play, but some of them would, and certainly we would not expect performance to be depressed. I excluded all 4th quarter drives to avoid known bias. Late in games, teams in desperation situations will often take more risk than otherwise warranted, causing a turnover or other event that favors the opponent. That opponent may not need to score to seal the win, which would suppress their scoring rates. I also excluded all drives that ended with the expiration of the half. Of course, where on the field the ball is obtained will have the largest effect on the likelihood of scoring, with or without momentum. To account for this effect, I broke out where drives started in 10-yd chunks of the field. Here are the results. 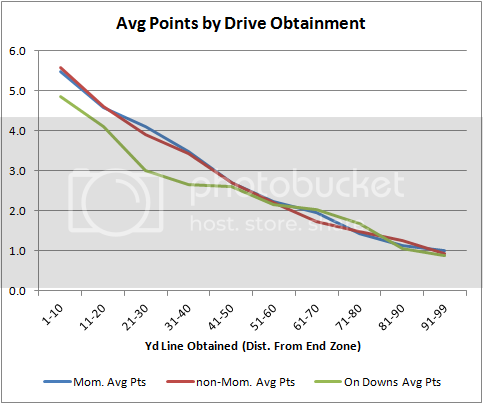 The first chart below plots the proportion of drives that result in TDs according to where on the field the drive began. The three lines represent how possession was obtained. The blue line is for momentous obtainment. The red line is for non-momentous obtainment. And the green line is for drives that began following a turnover on downs. If momentum has a real effect, we would expect the blue and green lines to be above the red line throughout the field. 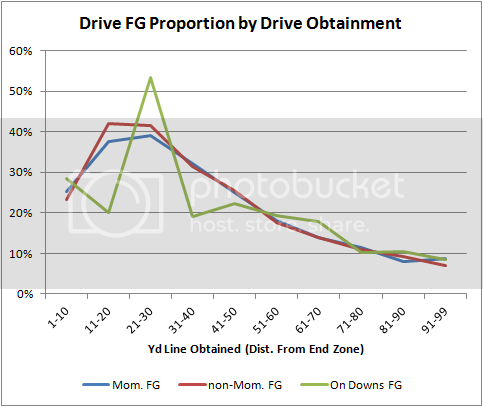 TDs aren't the only way to score, so here is the same plot of the proportion of drives that result in a FG. Note that the sample size of 'turnover on downs' cases is very low deep in a team's own side of the field, for logical reasons. Of the 998 drives obtained on downs, only 32 were obtained inside the 30 yard line. To measure the combined scoring success for TDs and FGs, I computed the average points scored per drive--7 points for a TD, 3 for a FG, and -2 for a safety. Note this is a much simpler metric than the Expected Points concept, which measures net point potential. Just as above, if momentous events lead to increased subsequent performance, we would expect to see increased scoring rates on drives following those momentum-swinging events. It appears, possession gained by momentum-swinging means does not produce any additional chance of scoring on the subsequent drive. If anything, it appears to slightly decrease. And possession gained by a turnover on downs results in fewer points scored by the team that made the stop. This analysis covers only part of the definition of momentum. For example, it does not examine the effect of big offensive plays or kick returns. However, it does examine the majority of events commonly thought of as momentum-swinging. It also ignores events after the drive immediately following the momentum-swinging event. But I think everyone would agree that the notion that momentum is somehow real but has no effect on the most proximate subsequent events is implausible. I'll take a look at other measures of momentum in future articles. The second part of this series uses the Win Probability model to see if teams win more often following a momentum-swinging play than the model would expect. In the meantime, here are some previous looks at the concept. Football Freakonomics - Is Momentum a Myth? Is Momentum Descriptive or Predictive? "After your defense forced a turnover, it seemed like your team had all the momentum. Can you explain how you didn't see the cornerback cut in front of your tight end when you had all that momentum?" I've been doing my own amateur statistical analysis long enough to know that quantifiable, team-based momentum is a myth. However, sports psychologists have illustrated that *individuals* can at times reach altered mental states whereby they can achieve heightened results. Players often refer to this as being "in the zone". When they are "in the zone", basketball players claim that the basket seems as though it's as wide as a garbage can and quarterbacks claim that the game "slows down". This isn't just a mental trick. Being "in the zone" has measurable physiological effects - e.g., lowered heart rate, halting of perspiration, etc. In fact, this effect of being "in the zone" is very much akin to meditation - even though it is happening in a fast-paced competitive environment. So although I don't believe that teams as a whole can achieve (or lose) "momentum", I do think it's feasible that a handful of key players (e.g., a quarterback and a receiver) can be "in the zone" at the same time. Although football is probably the ultimate team sport, it doesn't take more than a few players playing above themselves to quickly impact - and maybe reverse - the course of the game. Brian--great analysis, one that I'm sure I will be debating with my father-in-law over the next few days. A possible counter-argument I can think of is that teams only "have momentum" after they capitalize on a potential momentum-swinging event. For example, if they get a turnover and are able to score, then they are they more likely to score/prevent a score on subsequent possesions? My suspicion is that the answer is no; but the data contains the real answer. I thought injuries were the main source of momentum in the NFL. "it does not examine the effect of big offensive plays." I suspect that you mind find an effect when a defense gets beat on a deep ball. They may come out the next series playing off the receivers, allowing the opposing offense to move down the field more easily. I agree with your thesis though, even in this case, it is not momentum in the way that people think of it. Momentum is just a cheap way for announcers and analysts to talk about something without actually understanding why one team is better than another. It's either self-fulfilling, or they say that momentum is easily lost. And nobody ever calls them on their BS. They just keep getting paid millions. I'm with the Anon right above me. Most 'momentum' that you see is because one team has figured out the opponents schemes or there is an injury. This isn't a magical 'momentum shift', it is an actual event that changes the relative abilities of the two teams. When you strip out that and the fact that random events can be streaky, you aren't left with a lot to put down to momentum. But, it keeps analysts in a job to talk about it as though it's some sort of magical phenomenon that they can feel by being in the stadium, so they keep talking about it. Given a 1st and 10, Team A normally gains a first down 70% of the time. Having just gotten a first down, Team A gains a second first down 73% of the time. Having just gotten two consecutive first downs, Team A gains a third first down 75% of the time. IE, once they're rolling (within a drive), they are harder to stop. @John Mooney: And then when the data says no, the counter argument will be "Well its only REALLY obtained when you score AND THEN get a stop immediately after. For sure then you have momentum"
And when that fails: "No, I mean you have to score, get a stop, then score again." And when that fails: "God why do you stat nerds try to understand the game with numbers. I know momentum when I see it. Just go watch (insert game with large win probability shift here). You telling me that happened at random? Lol watch the game instead of the boxscores nerd." That's true. The goal posts will move as with most things held near and dear to convention. Fortunately, in the process of doing analysis like this, I'll eventually have a data infrastructure and framework to test any combination of definitions of momentum. I'm actually a little surprised you didn't find a momentum effect due to selection. That is, I would imagine that bad teams are more likely to muff a kick, fumble, throw an interception, etc. Thus the other team would be more likely to score because they were generally better than the opponent than a team getting the ball off of a kickoff or punt. Maybe a sign of the weak correspondence between offense/defense/special teams quality within a team? If I had this data, I would study momentum using an autocorrelation of SR as a function of time using a variety of bin sizes (number of plays to average to get SR). If momentum exists, a team that has which has succeeded on a play will be more likely to succeed on the next play than the same team would be to succeed on some later play when they may or may not have momentum. That's exactly what autocorrelation is designed to probe. Great work so far. I'm sure you're aware that Bill Barnwell has looked at similar topics. I hope you don't find any evidence of momentum, not necessarily because I don't think it exists (which I don't), but because you'd have to redo your win probability models, and Keith would have to redo his Markov drive models. Both of those implicitly assume there is no momentum, i.e., all that matters is the current state of the game and not how you got to that state. I feel like anytime a team starts a drive from the opponent's territory, that could be defined as a "momentous" start to the drive. I mean, in order to have a drive start there, you either have a turnover (defined in the article as momentous) or a really long kick/punt return. Long kick returns may not be considered momentous because other than the start of the half, the only way you return a kick is if the other team just scored. But long punt returns (and the rare long return of a free kick following a safety) could possibly be considered momentous events - they immediately follow a strong defensive performance. It seems to me that if you want to measure momentum, you would have to look at multiple drives, not how a drive started. See if a team that has < 0.5 WP improves their offensive performance on subsequent drives or something. But then again, "momentum" is such a nebulous and mostly made-up effect anyway that it practically defies any attempt to define or measure it. I say the only reason why the Ravens won the Super Bowl last year was because of Ray Rice. He made everyone preform better. Now they want him on their sideline on games and practices just so they can win. Momentum has a lot to do with sports. Even with baseball. Obviously the Red Sox had more momentum going because of everything that happened prior to the World Series and they won. Of course they were a good team anyway, but the momentum helped. From a statistical standpoint, few things are less interesting than a failure to disprove a null hypothesis. I''m stunned that this many articles have been devoted to what seems to be little more than poorly defined terms. Why not simply _defined_ momentum to be a psychological state corresponding to a short-term change in the direction of a game? If people would do that, we wouldn't have to waste so much energy on refuting what is little more than a straw men. Or are there serious people out there arguing that a turnover regularly and reliable changes the level and direction of play for an extended period of time? I know you addressed it in your last paragraph but I think it wasn't emphasized enough. IMO any possession within 40 yards of the endzone is pretty much a momentous possession...whether its a huge punt or kick return, shanked punt, I can't really think of anything else. I think a better way to compare them would be, possessions obtained at those yard-lines versus drives where they reached those yard-lines with a first down. That would take into account alot more factors of momentum. One thing that wasn't addressed that I was thinking throughout the article was fatigue. Lets say a defense just gave up a 7 minute drives, then their offense turns it over within the 40, and they have to get right back on the field. And looking at the psychological aspect, while the offense will get an emotional uplift from a turnover, the defense is on the edge thinking they have to play their best to bail their offense out and win the game. I think this aspect will take into account team psychology, leadership, fatigue, history of being in that situation, frequency of being in that situation. Obviously the Jags defense isn't going to respond the same way that seattle or san francisco would. I also thought of the autocorrelation function, but you would have to untangle the fact that a better team (playing a worse team) will have positive plays autocorrelated and vice-versa.